ADOPT-A-THON UPDATE – We’re nearly there! What a weekend! Thanks to your support 234 cats and kittens are shook off the Monday blues with their new families after a great weekend of adoptions. We are now just 16 adoptions away from reaching our 2016 Adopt-A-Thon goal. With our goal within reach we need your help now more than ever to help us reach it! Remember there are a lot of ways you can help us reach our goal this April. So if you are not in a positon to adopt, why not advocate for some of our adoptable cats such as Christy from North Melbourne or Izzy from Campaspe. Every bit helps! 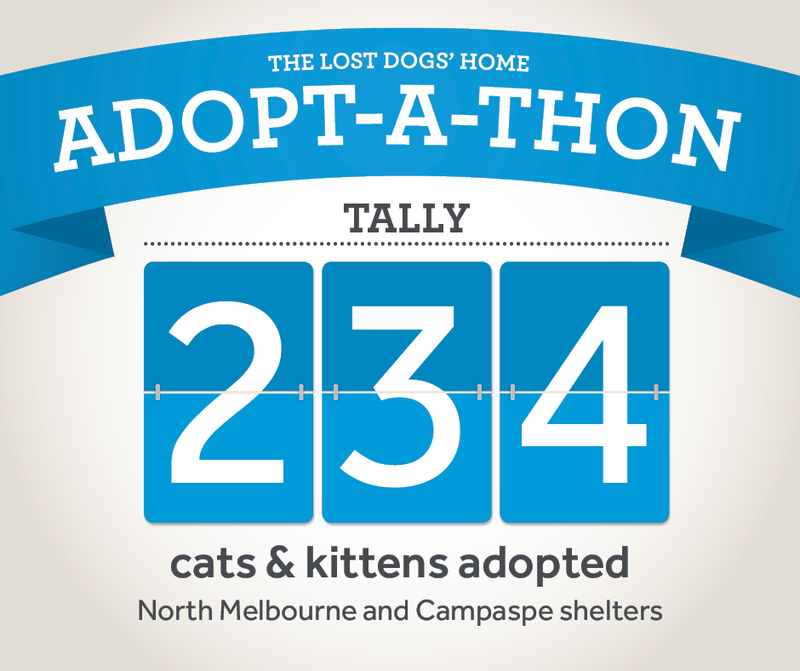 Until April 30, The Lost Dogs’ Home is waiving the adoption fees of cats six months and older at our North Melbourne and Campaspe shelters. We are also halving the adoption price of kittens under six months to $90. Each adoptable cat and kitten comes fully health checked, desexed, microchipped, vaccinated and wormed, valued in excess of $300 per cat. To receive the offer, adopters will need to successfully complete the Home’s Pet Licence Test online at petlicence.com.au or at our North Melbourne or Campaspe shelters. Whether you are in the position to adopt or not, there are a number of ways you can help us find homes for deserving felines in need this April. If a cat or kitten catches your eye, visit our North Melbourne or Campaspe shelters to meet them in the fur – our adoptions team are on hand to help you find your perfect match! Existing cat owners are encouraged to check their council regulations on the number of cats they can own per household. Some councils require households with two or more cats to register for permits. Don’t forget, you’ll need to complete your Pet Licence Test in order to receive this offer. Foster – We are always on the lookout for foster carers to help us look after cats and kittens in need. With foster care periods lasting from two days to four weeks, it is a terrific way to give a cat time out in a home environment, while creating essential space at our shelters. All expenses are covered and successful applicants will be notified within two weeks of applying. To find our more visit our foster care page. Advocate – If you are not in a position to adopt or foster, why not advocate for a cat or kitten looking for a home this April? You can share adoption candidate profiles via your Facebook page, email or even through good ol’ word of mouth!